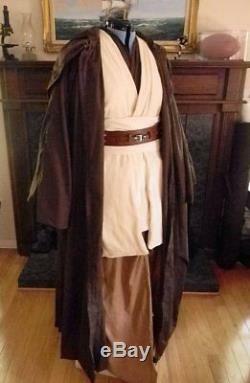 Authentic reproduction of Obi-Wan's Jedi costume! This outfit will be made with YOUR measurements. Turn around time is 2-3 weeks from the day I receive your measurements. Pictured above : Color variation is due to lighting!! 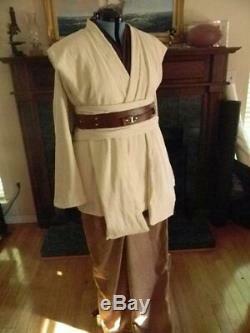 Shown are 2 separate costumes, full costume and robe, a picture of the Undertunic alone with single lapel. Leather belt shown is not included!! Examples of single, double, and triple undertunic lapel options are shown. Undertunic: single layer Broadcloth, long sleeves with elastic at wrists. Single, Double, or Triple Lapel (see close-up pics). Overtunic: double layered Crinkle Gauze, lined in cotton, long flared sleeves. 2 Tabbards: double layered Crinkle Gauze, lined in cotton, snap at shoulders. Sash: Crinkle Gauze, lined in cotton. Pants: Broadcloth with elastic waist, drawstring, or both. 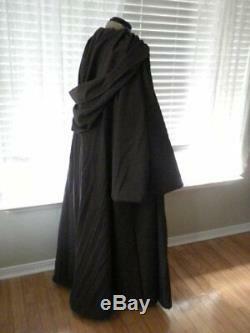 Robe: Broadcloth with large sleeves, pockets for keys, and detachable blade - if desired. The outfit is made from 2 layers of Cotton Crinkle Gauze and lined in cotton. Poly/Cotton Broadcloth is used for Pants, Undertunic, and Robe. 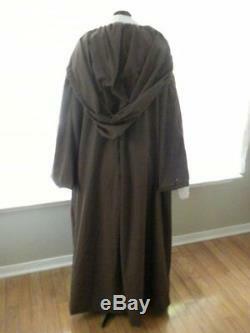 "Natural" cotton gauze is shown with a brown Undertunic and beige Pants, but black, gray, etc. This is your costume, I'm here to help you put it together! Fabric info: Broadcloth is the fabric used for Men's Dress shirts, a light to medium weight fabric. 100% Cotton Crinkle Gauze, 2 layers are used and lined in broadcloth. Please let me know what I can help you with and have a wonderful day! If you have any questions at all, let me know. Thank you for looking and I hope to sew for you. 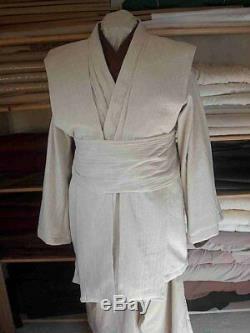 The item "Obi Wan Star Wars Jedi Custom Costume AND Robe, Authentic reproduction in GAUZE" is in sale since Thursday, January 3, 2019. This item is in the category "Clothing, Shoes & Accessories\Costumes, Reenactment, Theater\Costumes\Men". The seller is "kjaereliten" and is located in Spanish Fort, Alabama. This item can be shipped worldwide.